"Paradise Drive” is the name of the road leading to San Francisco State’s Estuary and Ocean Science (EOS) Center. 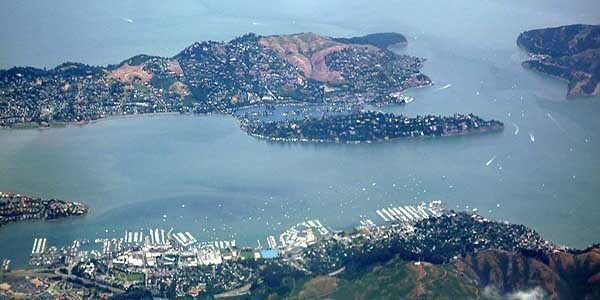 It lives up to the name, meandering along the northeastern edge of the Tiburon Peninsula with forest on one side and clear views of the San Francisco Bay on the other. You can catch a glimpse of the Richmond-San Rafael Bridge before turning sharply off onto a steep road that takes you past old naval buildings, a gleaming solar array and white tanks holding local aquatic species — the scientific trappings of current research and education projects juxtaposed against the remnants of the site’s past lives. For centuries, the bayside slope the EOS Center calls home was Miwok territory. A plant for processing and packing cod and a Navy fuel depot were established there in the early 1900s, and later it was home to a maritime academy and a construction company that twisted the cables that support the Golden Gate Bridge. It returned to its naval roots during World War II, then served as a site for federal research. SF State acquired the land in 1978. The EOS Center is still the only marine science laboratory dedicated to research and scholarship located on San Francisco Bay, bringing together biologists, chemists, geographers and oceanographers under the same roof. That interdisciplinary approach is crucial when studying complex coastal and ocean ecosystems. Even a scientist focusing solely on marine life has to understand the water in which it lives and the many ways that people impact coastal habitats, explains Professor of Biology Jonathon Stillman. Mazzini specializes in the study of the physical properties of the ocean, especially its currents — and since joining the Center in 2017, he’s taken a dive into interdisciplinary work. A graduate student in his lab, Bianca Bahman, is working on the intersection between physical processes in the ocean and shark behavior, and Mazzini is also collaborating with Adjunct Professor of Biology Richard Dugdale to study the nutrients carried by a major current that runs along the California coast. He’s also working with a long-running dataset to understand the surface currents that connect San Francisco Bay to the ocean. This work is important to understanding how climate change might influence the Bay, since a changing climate will alter both the chemistry of the ocean and the wind patterns that drive ocean circulation. An EOS Center researcher takes a closer look at the native seagrass from the Bay. An EOS Center researcher takes water from the Bay for testing. An EOS Center researcher sifts sediment from the Bay. In 2007, a cargo ship struck the San Francisco Bay Bridge, spilling over 50,000 gallons of oil which spread across miles of the coast. Events like these unfortunately make the San Francisco Bay a laboratory for studying the damage humans have inflicted on the world’s coasts. They also provide opportunities for researchers who want to undo some of the damage. Boyer’s research and restoration work focuses on salt marshes and eelgrass beds. “They’re habitats that are used by lots of other species for laying eggs, hiding from predators or finding food on the surface of leaves or among the roots,” she explains. They’re also extremely vulnerable to the side effects of human activity. Careful experimentation after the 2007 oil spill has taught her the most promising techniques and areas for restoration, and more recently she’s begun to explore other ways that eelgrass could be useful to buffer the Bay from human impacts. Boyer and other scientists at the EOS Center benefit from being the only research laboratory with a shoreline on San Francisco Bay. With a boat ramp right on campus, a scientist’s field site is often just a boat ride away. And a specialized water-delivery system that pumps water from the Bay straight into the campus’ research facilities means a foray into the field isn’t always necessary. It allows scientists to conduct experiments on Bay Area species in a more controlled environment and to raise plants in a greenhouse before bringing them out in the field to seed restoration projects. In the past few years, the Center has strengthened ties with the National Estuarine Research Reserve (NERR) and the Smithsonian Environmental Research Center, both headquartered right on the campus. For Mike Vasey, director of the San Francisco Bay NERR, the EOS Center represents both a source of knowledge and community. “There’s the opportunity to be a part of an academic community with really excellent scientists and graduate and undergraduate students,” Vasey says. In return, NERR, which serves as a steward for historical tidal wetlands and coordinates restoration and monitoring projects elsewhere in the Bay, provides access to restoration sites and links academics to people working locally in restoration and policy. “We get people out in that broader community and provide more hands-on type learning,” Vasey says. Because it’s situated right on the largest estuary on the West Coast, the Center also plays an important role in scientific efforts to understand how the world’s coastal ecosystems are changing. For instance, EOS Center scientists launched a pair of buoys in February as part of the Central and Northern California Ocean Observing System (CeNCOOS). As the ocean absorbs the greenhouse gas carbon dioxide from the atmosphere and grows more acidic, water quality in the Bay may be affected. So the buoys, anchored just offshore of the campus, will measure how this acidification is playing out now and in the long term to impact aquatic life in the Bay. While helping to keep track of the health of the local environment, it will also contribute data to the CeNCOOS network in order to help scientists understand the effects of climate change on a much larger scale. 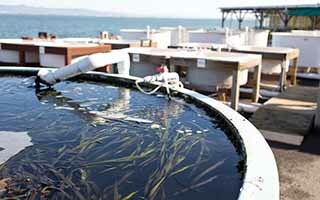 Eelgrass research at SF State's Estuary & Ocean Science Center at Tiburon. 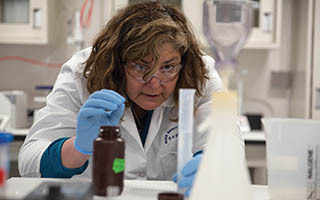 EOS Center Director Karina Nielsen gets hands-on with samples in the lab. 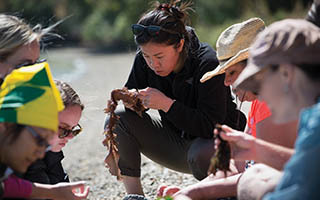 Part of the work of scientists at the Center is passing on their stewardship of the Bay to the next generation of researchers, managers and policymakers. “We want our students to think about big problems in the ocean and estuary from lots of different perspectives,” says Stillman. In fall 2017, he and other faculty affiliated with the EOS Center admitted the first cohort of 12 graduate students to RIPTIDES, a graduate training program — supported by a National Science Foundation Research Traineeship grant — that eschews traditional disciplines. Students in RIPTIDES will instead earn a master’s degree in interdisciplinary marine and estuarine sciences. During the first semester, students explored complex environmental problems as case studies, then worked in teams to solve various aspects of each problem while considering it in its full complexity. “The questions are usually more about how to manage the issue. Finding a solution that fully resolves the problem isn’t always possible,” says Cheryl Patel, a student in the first RIPTIDES cohort. As they’ve progressed through the master’s program, students are identifying topics and beginning their research projects, aided by at least two mentor-professors. 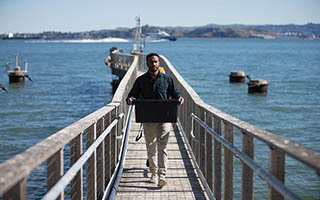 And this fall, they’ll begin internships designed with an eye toward practical experience with Bay Area organizations such as the Bay Conservation and Development Commission, the Exploratorium and the NERR. After students graduate, their passion for the Bay often remains. Gavin Archbald received his master’s degree in 2011 after studying invasive plant species in salt marshes. Now he works for the ecological consulting firm H.T. Harvey and Associates, helping plan restoration projects in the Bay Area. “EOS is very practical skills-oriented,” Archbald says. “You come out of there well rounded in terms of knowing lots of people in the field and having a good understanding of the actual projects taking place in your backyard.” Other alumni work throughout the Bay and beyond, leading conservation efforts, driving policy changes and studying the complexity of coastal ecosystems — ensuring that the Center’s mission carries on.